T he Atlantic Ocean has never been a silent place , what with the whales and their jabbering, the dolphins and their mating calls. The underwater sound waves of earthquakes, volcanoes and waves are background noise, akin to the hum of air conditioners in the summertime. But over time, the noise beneath the sea grew louder, at times, even deafening. First, the ships. And over the centuries, trans-Atlantic cable, Navy sonar, submarines, even bombs. And now, the air guns. 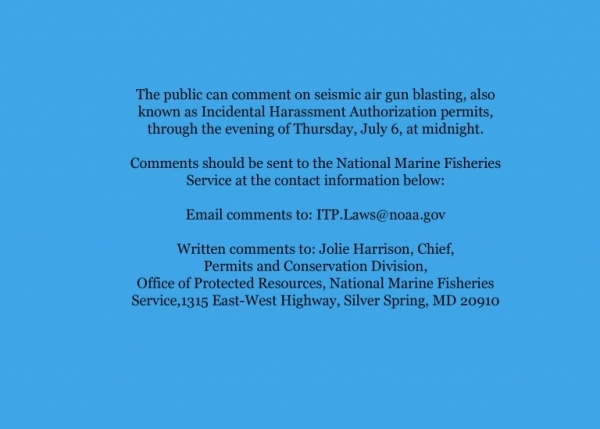 The National Marine Fisheries Service  is considering allowing energy companies to fire seismic air guns up and down the Atlantic Coast in search of oil and gas. Seismic air guns use compressed air to generate pulses of sound — excruciatingly loud sound, 250 decibels — every 10 to 15 seconds for months at a time. For whales, dolphins and sea turtles, who communicate by sound, this noisy environment is akin to people trying to converse — say, hold a business meeting, read to their children, call the fire department — over the roar of a jet engine 100 feet away. Under the Trump administration, the National Marine Fisheries Service could issue as many as five “Incidental Harassment Authorization” permits to allow oil and gas companies to use the tests to survey the ocean floor for potential drilling sites. The area runs roughly from Delaware down the coast to Florida, including North Carolina. Seismic testing is only the first step in a process that could forever alter the environment of the North Carolina coast. Under the Obama administration, offshore drilling could occur no closer than 50 miles from the Atlantic Coast. But under President Trump, that distance has been reduced to just three miles. Oil rigs would be well within view of the Carolina beaches and fisheries, drawing any environmental and economic damage even closer to the coast. 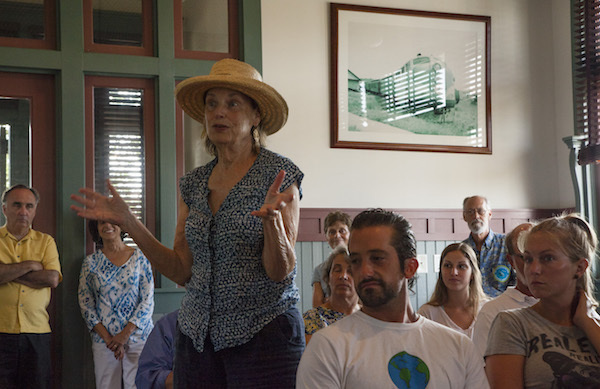 These threats have united people who often disagree: Republicans, Democrats, environmental advocates, fishers and business representatives — including the Business Alliance for Protecting the Atlantic Coast  — all of whom want to protect the state’s $1 billion coastal health and economy. Initially, scientists were concerned about the well-being of marine mammals and sea turtles. But scientists have learned that seismic air gun testing harms living beings further down the food chain. Fish, even zooplankton — tiny organisms that marine life feeds on — can be harmed by the noise. Any threat to marine life also threatens North Carolina’s $157 million seafood industry. 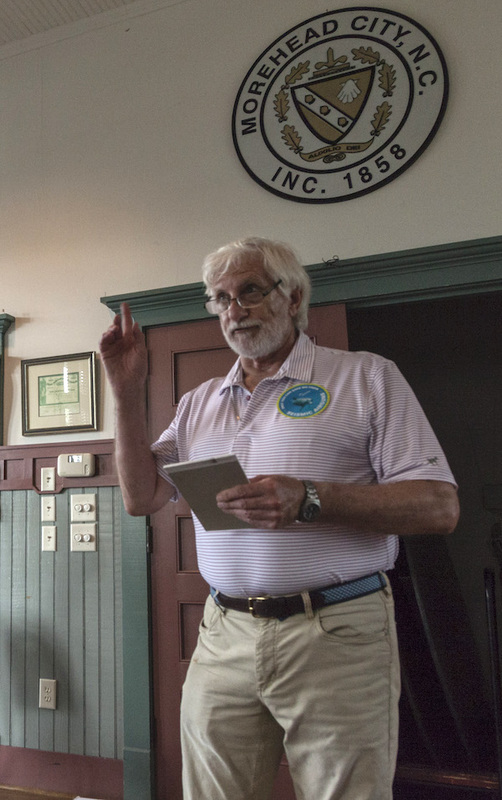 It could livelihoods of people like Mark Hooper, a commercial fisherman of softshell crabs, and his wife, Penny, who were asking people in Morehead City to file public comment against the practice. Members of Congress are also submitting comment against the tests. On June 28, dozens of US House members, including Republican Walter Jones Jr., who represents areas of coastal North Carolina, and Democrat David Price of Chapel Hill, sent a letter  to Interior Secretary Ryan Zinke, vehemently opposing the seismic air gun surveys. The letter cited a 2014 study conducted off North Carolina’s coast by the University of North Carolina Chapel Hill, Duke University and NOAA. The research found that, during seismic surveying, the number of reef-fish declined by 78 percent in the evening, a time of day when fish use of that same habitat was highest on the previous three days when seismic surveys were not being conducted. Even worse, because of the way sound travels through water, the blasts of seismic air guns can be heard greater than 2,500 miles from the source, according to Nowacek, the Duke University scientist. That distance is equivalent to two-thirds of the way across the Atlantic Ocean. But the United States’ reliance on petroleum imports has declined since 2005, according to the US Energy Information Administration. A decrease in consumption, an increase in biofuels and existing production in the Gulf, for example, have contributed to the decline. The US already produces 75 percent of the petroleum it uses; it imports the remainder, primarily from Canada. North Carolina has been targeted for oil and gas drilling before, but the state has managed to prevail over those interests. In 1988, Mobil successfully bid $103 million for the rights to a nine-square-mile leasing block of an area off the Outer Banks, known as the Manteo Unit or The Point. At the time, Mobil believed the reef contained 6 trillion cubic feet of natural gas. The company proposed drilling an exploratory well but North Carolina, in its review of the company’s required exploration plan, deemed it inconsistent with the state’s coastal protection laws. Mobil appealed the state’s decision to the U.S. Department of Commerce, but lost. In 1995, Chevron began looking at an area within the Manteo Unit for drilling and Morehead City for its onshore operations. The state, under Democratic Gov. Jim Hunt, approved Chevron’s proposal. But President Bill Clinton foiled Chevron’s plans when he issued an executive order removing from consideration all unleased areas of the Atlantic Outer Continental Shelf until 2012. Gov. Beverly Perdue opposed drilling in part, because the state would receive no royalties from oil and gas production. (She favored off-shore wind, and joined North Carolina in the Atlantic Wind Energy Consortium.) “Simply put, no state can or should make decisions that could forever alter the state of its coast and economy without a firm commitment as to its share of the revenue,” Perdue wrote to the federal government in 2009. In 2014, Gov. Pat McCrory advocated for offshore energy exploration in North Carolina; so far, Gov. Roy Cooper hasn’t taken a definitive stance.